All Terra homes currently listed for sale in Terra as of 04/21/2019 are shown below. You can change the search criteria at any time by pressing the 'Change Search' button below. If you have any questions or you would like more information about any Terra homes for sale or other Terra real estate, please contact us and one of our knowledgeable Terra REALTORS® would be pleased to assist you. "Live where you play! 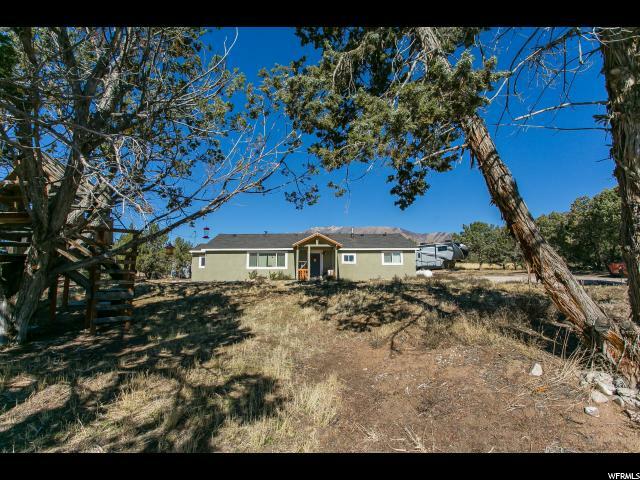 5 Bedroom completely refurbished stucco'd ranch style home on 5 acres backing (with its own access gate) BLM land! The Onaqui Mountain Range is prime ATV country and it is right out your backyard! No hauling the toys or horses, just hop on and go for a ride. This is an outdoor enthusiasts paradise - hiking, shooting, rockhounding, metal detecting - all within 2 minutes out of your back door - Lookout Pass, Simpson Springs, Pony Express Trail Station, the Dugway Goode Beds and Fish Springs National Refuge are just moments from home, and wildlife such as deer, rabbit, bobcat, turkeys, coyotes and mountain lions roam this area. Home has been refurbished with top of the line septic system and chambered drain field, new water softener with whole home filter system, commercial grade hot water heater with recirculation timer (cuts down on wasted water, hot water on demand), reverse osmosis drinking water system, and a new 2 hp well pump system. In addition to the forced air furnace (propane fuel, and the tank is owned not leased) there is a Heritage pellet stove that warms the entire home. Open concept with master bed and bath away from the other 4 bedrooms, it boasts welcoming indoor and outdoor living spaces - spacious patio and BBQ area - and large fire pit built with rock from local area. Established circular driveway, fenced garden area, chicken coup, shed and a number of outbuildings. So many places for the kids to build a fort! Garage is extra tall. Water rights allow for 10 livestock, and the property is fully fenced - Simply the best of both worlds, commute times (and conditions) are much more enjoyable coming from here:) 35 minutes to Tooele, an hour to SLC or to Saratoga Springs and a few minutes to Dugway Proving Ground. Seller is offering a $3000 carpet allowance to help freshen the place up! WATER RIGHTS - Application to Appropriate water right number 16-101 says there are .015 bfs which the conversion application st"